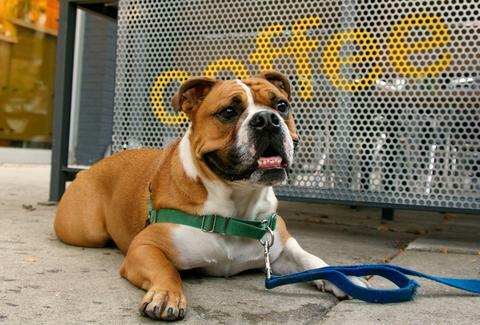 Los Angeles might have thought it was getting the nation's first dog cafe, but as usual, New York City will (rightfully) try to steal its thunder. That's because there's now a separate Indiegogo campaign to bring the first US dog cafe where it belongs: the greatest city in the world. This is the cause New Yorkers have been waiting for: the chance to avoid crazy cat lovers, play with rescue dogs, and beat LA at yet another endeavor (besides sports, restaurants, culture, etc., etc.). And with a funding goal of $70,000 -- which is $130K less than the LA cafe's goal of $200,000 -- NYC stands a legitimate shot at getting the first (and we assume best) pooch coffee shop in the States. Inside the prospective Manhattan cafe, there'll be a 630sqft playground for the canines concealed in a glass room with a separate entrance from the seating area (to meet Health Dept. guidelines). You'll be able to grab a table outside the playground, where you can enjoy a coffee, tasty food, and the sight of numerous rescue dogs frolicking to their heart's content -- or you can head into the room and join the frolicking yourself. And if one of the little buggers tugs enough on your heartstrings, you'll be able to make the lil pup is yours to keep. As of publish time, the LA dog drinkery had raised $6,734 since it launched on Dec 16th, and it has 21 days to raise the additional $193,266. Comparatively, the NYC Indiegogo raised $446 since it began on Dec 23rd, and has 37 days remaining on the campaign. LA may have more money banked, but NYC has more time, and New Yorkers certainly know how to take advantage of valuable New York minutes. So if the thought of enjoying a blissful morning amongst man's best friends with a tasty cup of joe right here in NYC isn't enough to motivate you to open your heart/wallet, then the chance to beat LA at yet another thing certainly should. Pete Dombrosky is an Editorial Assistant at Thrillist and if this dog cafe happens, he'll be working remotely from now on. Bark up his tree on Twitter.